A compact site challenged the goal of peaceful coexistence for a building that improbably combines the performing arts spaces with athletic training rooms and a gymnasium used for NCAA competition. Clever placement of structural isolation joints, attention to structural resonant frequencies, and integration of spring and neoprene isolators help to keep the peace. 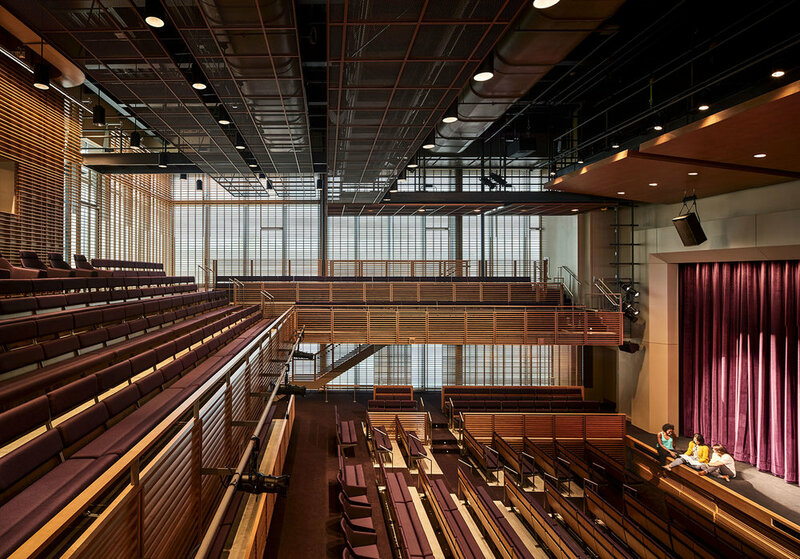 Glass walls enclose the theatre, their potentially harsh acoustic effect moderated by a wooden screen that adapts in form as it wraps the room -- emphasizing reflection near the stage and diffusion behind the audience. The result is a vibrant, transparent space that retains acoustic warmth and support for those inside. Music, drama, and dance rehearsal rooms live right below the theatre, each daylight with ample glass that conveys an attitude of extroversion and community. Despite the glass, each room is thoroughly isolated from the others, inviting boisterous activity. AV system infrastructure links the spaces to a central recording control room while allowing each one to function on its own for playback and live sound reinforcement.